President Rodrigo Duterte on Tuesday, August 21, sends a heartfelt message as Filipinos commemorate the 35th death anniversary of former Senator Benigno ‘Ninoy’ Aquino, Jr. 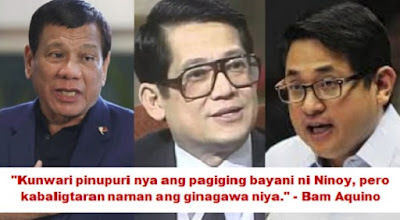 But while a lot of Filipinos admire the president for his statement, Senator Benigno ‘Bam’ Aquino IV seems to be not pleased and criticized President Duterte. “I join the entire Filipino nation in celebrating Ninoy Aquino Day. More than three decades ago, Benigno S. Aquino, Jr died while fighting to restore peace and democracy in the Philippines.” President Duterte said, noting that Ninoy’s death gave birth to the freedom that Filipinos are enjoying today. "In this time of real and lasting change, we need more citizens like him so we can steer our country towards the direction where a brighter and better future awaits us all. Let us take this opportunity to reflect on his sacrifice as we honor the courage and patriotism that Ninoy demonstrated during his struggle," The tough-talking president added. In addition, President Duterte also called on all government officials to use Ninoy’s commitment to freedom as a "guidepost as they advance the welfare of our people, especially the oppressed and marginalized.” And although Sen. Bam Aquino, Ninoy's nephew, thanked the president for his message, he still took a blow at him. As we all know, Ninoy Aquino is was the top opposition figure during the administration of President Ferdinand Marcos. He returned to the Philippines on August 21, 1983, but he was assassinated at the tarmac of the then Manila International Airport. This incident triggered the 1986 EDSA Revolution, which led to the downfall of Marcos and the presidency of Corazon Aquino, Ninoy’s wife. On the other hand, President Duterte is an ally of the Marcos family and even allowed the heroes burial of former president. With that fact, Sen. Bam Aquino does not believe the sincerity of his message. “While the president seems to be honoring the sacrifices of our hero Ninoy Aquino, he is doing the exact opposite. He is now suppressing our freedom, especially the poor.” The Liberal Party (LP) senator said in a statement.